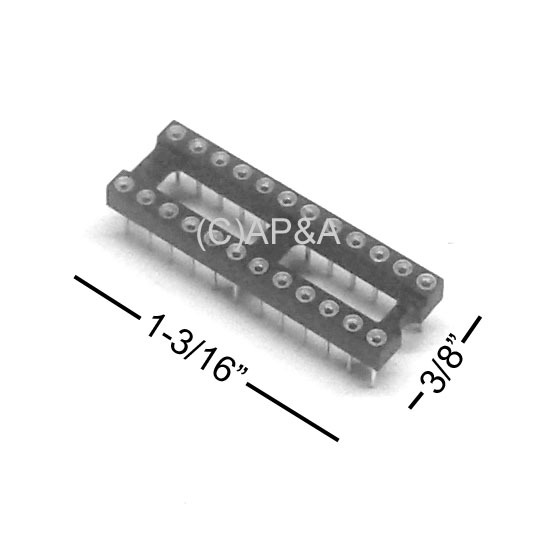 24-pin narrow DIP chip socket. For chips with 5/16-inch spacing between chip legs (side-to-side). Measures 1-3/16 inches long x 3/8 inches wide x 5/16 inches tall (30mm x 10mm x 8mm). High-quality machined-pin style that provides maximum connection/grip between chip socket and chip legs for reliable long-term performance, and will far out-perform factory original standard low-profile non-machined pin sockets. Used for many TTL IC's in late-model games. Always install a chip socket when replacing a non-socketed chip on your circuit boards! A chip socket allows for quick, easy, solder-less removal and replacement for testing or repair in the future, and saves your valuable circuit board from unnecessary soldering heat that can cause damage or shorten its lifespan.